Copa America 2016 Centenario is a centenarian celebration tournament of Copa America hosted in USA. Here is the complete schedule and results of Argentina national team at 2016 Copa America Centenario. First match was against Chile and won by 2 - 1 on 7th June 2016. Then against Panama on 11th June won by 5 - 0 and against Bolivia by 3 - 0. 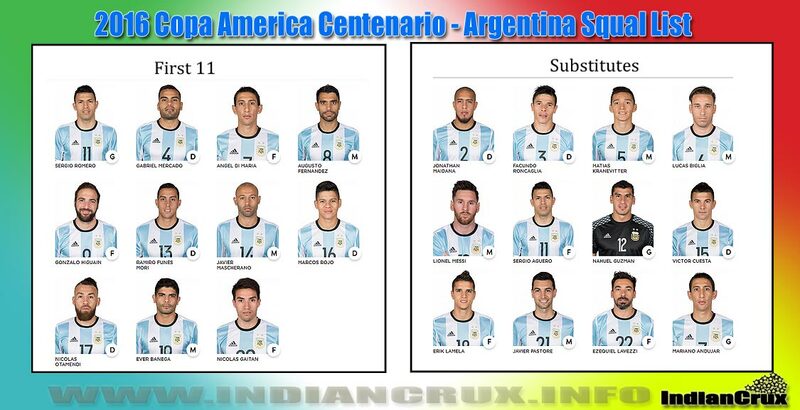 Argentina won all the three matches in group stage become the group champion. Quarter final match is against Venezuela on 19th June 2016. Argentina lost the Final match against Chile once again in Penalty Shoot out. Regular 90 and extra 30 minutes were ended as goal less draw. Then in Penalty Shoot out Chile Repeated their victory over Argentina in Copa America final as the last year. Messi Loosed the penalty.